With Chantal gone, will NY’s Studart and Davis be celebrated as horse racing’s next hot female jockeys? After moving to Southern Calfornia in time for last year’s Oak Tree meet, jockey Chantal Sutherland is heading back to Toronto today where she’ll ride at Woodbine Racetrack. Sutherland, who is slated to ride #4 Speedski in today’s eighth at SA, won 18 of her 154 mounts — or 12 percent — since the winter meet at Santa Anita began on Dec. 26. It’s a fair riding percentage, but Sutherland’s popularity soared far beyond her winning percentage, mainly because of her looks and her part in the “Jockeys” television show. Sutherland, who was named one of People Magazine’s 100 Most Beautiful People in 2006, is dating jockey Mike Smith and their relationship was the one of the main focuses of “Jockeys,” a recently completed doc-u-drama on the Animal Planet network. Smith will remain riding in Southern California and the two plan to visit each other frequently. As of March 29, Sutherland is ranked tenth in the jockey standings, but she was by far the most searched for jockey or trainer on the Maiden King website. From December until today, search terms including the name “Chantal Sutherland” were used 686 times all together by people who landed on this site. By contrast, the next most popular jockey is Joe Talamo who had only nine searches for his name. The most searched for trainer is Peter Eurton who had seven inquiries. Internet searchers plug terms into search engines like Google and websites are listed that carry related stories. When Internet users click on a website, the owners of the site get a listing of what term was used to get to the site. With Sutherland leaving the United States, and the television show “Jockeys” looking for a new venue, my choices as the favorites to be the next popular hot female jockeys are New York-based apprentices Jackie Davis and Maylan Studart. 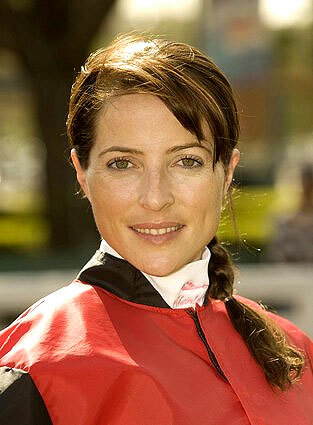 My personal opinion is that Chantal is an extremely strong jockey. She rode Mine That Bird and won at Woodbine….I know she loved(s) Mike but perhaps the reason it was more difficult at Santa Anita is his attitude. I only saw the relationship from the couch but he wasn’t shown to be a prince of a boyfriend. I was glad to see her leave him but sad to see her go back to Canada. I was very happy that she made the top 10 before she left….something I think she could have done sooner had it not been for, what I believe to be a “mental Mike Smith block”. But that is just my opinion from what I saw on the show. I think she is wonderful!